The Brewers Association released its annual report on craft beer this week. Overall, American breweries that met the trade group’s definition of “craft” produced 25.4 million barrels of beer in 2017. 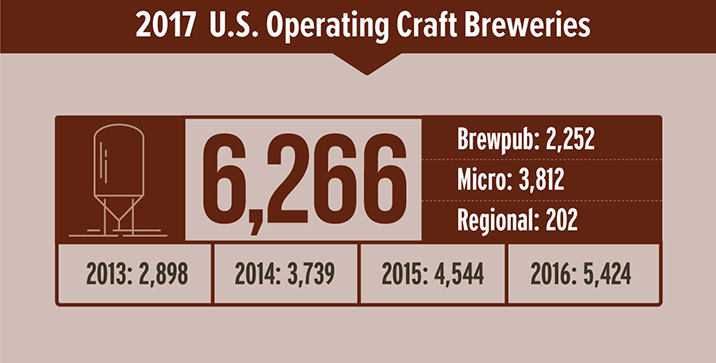 These numbers represent another strong year for craft beer. Sales volume was up 5% over 2016. A net increase of more than 800 breweries pushed the total count above 6,000 for the first time in recorded history. And craft beer earned a 12.7% share of the total American beer market, up from 12.1% the year before. The Brewers Association defines a craft brewer as small (less than 6 million barrels a year), independent (less than 25% ownership by a non-craft brewer), and traditional (in relation to ingredients and techniques). Although still clearly on the rise, craft beer is starting to see some subtle changes to industry dynamics. The boom period is a few decades old now and a natural evolution is underway. “Growth for the craft brewing industry is adapting to the new realities of a mature market landscape,” said Bart Watson, the Brewers Association’s chief economist. What this means is that the majority of craft beer’s most recent success has been enjoyed by the smaller players—specifically, microbreweries and brewpubs. Larger regional breweries with more ambitious distribution goals are feeling the squeeze based on consumers’ continued focus on drinking their neighborhood beer. Simply put, the market is more fractured than ever before, and the future seems to be many small neighborhood breweries rather than a few big ones. On a related and somewhat somber note, Watson said that recent expansion in volume can mostly be attributed to new brewery startups and not to additional volume from existing breweries. The growth trajectory has slowed a bit for the established players, with per-brewery growth at 200 barrels in 2017, compared to almost 900 barrels in 2014. Northwest Arkansas’ craft beer industry both typifies and bucks the trends outlined in the Brewers Association’s report. As is the case all across America, new breweries continue to open their doors in the region and taprooms are bustling with business. Area residents have seemingly embraced the emergence of craft beer and everything it adds to the local culture and economy. But on the other hand, Northwest Arkansas defies the per-brewery growth trend by seeing its breweries add significant production capacity. 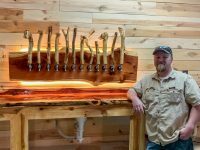 Bike Rack Brewing Co. — which recently announced plans for a downtown Springdale taproom — and Ozark Beer Co. each moved to bigger facilities and increased their output in the past year. Bentonville Brewing Co. is in a temporary spot until it can find a big enough location to spread its wings as well. And now Fossil Cove is working to quadruple its per-batch brewing output and shift its business model into high gear. According to owner and brewmaster Ben Mills, earlier plans for building a new facility on nearby brewery-owned property have been set aside, and he is now installing a brand-new 20-barrel brewhouse inside the former home of Lyn D’s Cajun Gypsy. The property — located at 535 W. Poplar Street — is just a few doors down from the existing brewery. The 7,500-square-foot building will hold the production brewery and administrative offices for Fossil Cove employees. Walls have been built and drains have been cut into the concrete floor. The various pieces of the new brewhouse are wrapped in plastic and sit in the fenced yard behind the building, waiting to be placed in position and turned on for the first time. 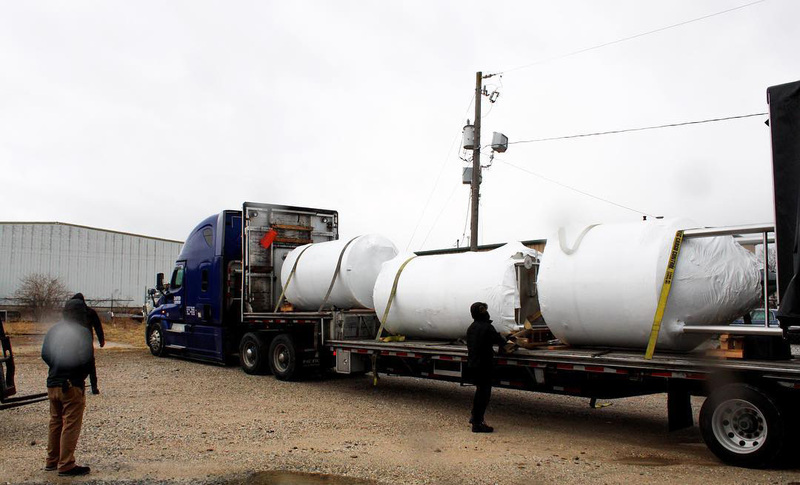 Fossil Cove’s new brewhouse, fermenter and brite tank arrived in late February. In addition to the new brewery, Fossil Cove will continue operating the original brewhouse and taproom at its current location. The 5-barrel system will produce small-batch and experimental beers and will support what has become one of Fayetteville’s most popular social spots. On its own, the original system can only support taproom sales and some limited distribution to Benton and Washington Counties. Fossil Cove has become a popular brewery since opening in June 2012, but only within a certain radius due to its reach. Mills said he hopes to use the additional output to strengthen his foothold inside the state. So far consumers have been able to find cans of La Brea Brown, Paleo Ale, and the rotating seasonal assortment—Hoppy Wheat, Whizzle, Blizzle, and Coffee IPA—at area package stores. The larger system will ultimately lead to more styles reaching package accounts. 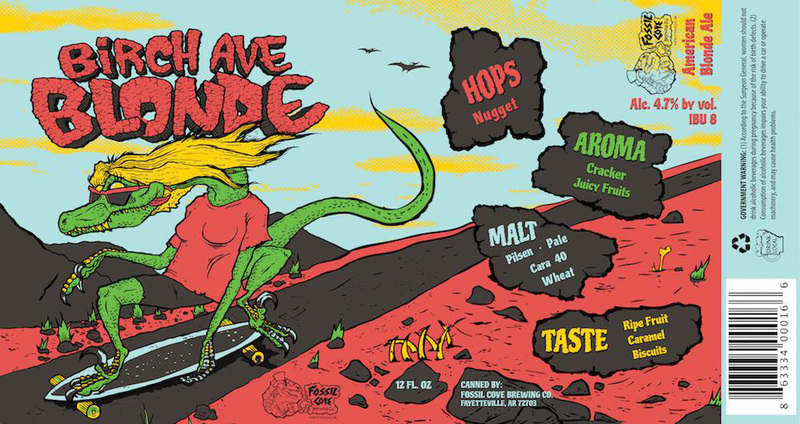 Mills says cans for Birch Ave. Blonde Ale will arrive in time for the new brewery to start production, and he hopes to send IPA #3 — which has been offered in cans exclusively from the taproom — to the market once up and running. Mills sees the trends outlined by Watson of the Brewers Association playing out in Northwest Arkansas. Like the numbers suggest nation-wide, beer drinkers here are spending their money at local breweries. And when they’re at a retail store, they look for local brands to take home and enjoy. But in defiance of those national trends, Fossil Cove is significantly growing its own volume through expansion. Mills says the brewery produced approximately 1,700 barrels of beer in 2017, but that number should swell once the expansion dust settles. “By the year 2020 we should top 5,000 barrels,” he says with both pride and a faint touch of exhaustion. Mills has done all of this before, of course, so he can lean on experience to tell him when something’s not right. He admits to obsessing over the slope of the floor drains, for example, knowing that being just the slightest bit off could lead to a brew-day disaster. There’s still much work to be done, but so far so good according to Mills. He says the new brewery could be operational by late summer if the pace of the buildout holds up.